In December 2008, Carmen Vega-Rivera received a white index card in her mailbox notifying her that she had 72 hours to report to Housing Court to answer charges that she had not paid her rent, or face eviction from her rent-stabilized apartment, a few blocks away from Yankee Stadium in the South Bronx. Vega-Rivera, then 54, had been dutifully paying her rent since 1981, when she first moved into the Art Deco building on the corner of Grand Concourse and 161st Street. But in recent months, she noticed that her landlord, Tiny Fiesta Realty, had stopped depositing her rent checks, and so she began cancelling them. Vega-Rivera, who is the president of the building’s tenant association, suspected that her landlord was retaliating for her complaints about the building’s broken heating system, rodent infestation, defective elevator, and leaky and moldy walls. “The boiler has just not been working for almost 25 years,” she says. “I was demanding repairs and exercising my rights as a tenant, and they weren’t depositing my checks.” Refusing to deposit tenants’ rent checks and then trying to evict them for nonpayment is a common harassment practice New York City landlords use. Vega-Rivera, who is disabled and unemployed, could not afford a lawyer, and was left to navigate the labyrinthine proceedings of Housing Court alone. “I was there representing myself,” she says. “No one can help you. Everyone’s yelling at you. There’s no navigation. There’s no brochures. There’s no [language] interpretation and I’m bilingual.” She finally won the case in August 2011. “If I’d had an attorney, my landlord would have never taken me to court,” she says. Thanks to a landmark agreement, low-income tenants like Vega-Rivera may soon have the right to a lawyer in New York City Housing Court. On February 12, Mayor Bill de Blasio threw his support behind the Right to Counsel bill, under which the city will provide free legal representation to tenants who make less than 200 percent of the federal poverty level, or below $48,000 for a family of four. It would make New York the first U.S. city to provide legal services to all low-income tenants facing eviction. Housing activists have waged a three-year campaign to pass the legislation, which they argue will curb gentrification and the displacement of low-income residents by preventing illegal evictions. In 2014, only one percent of tenants in New York City Housing Court had lawyers, while over 90% of landlords did. It is estimated that half of the tenants without attorneys are evicted. “Housing Court is chaotic,” says Raun Rasmussen, executive director of New York City Legal Services, the largest provider of free legal services in the country. “The laws are complex, and without representation, it’s very hard for a tenant to get a fair settlement resolution of her case, so having a lawyer will make a huge difference just in terms of fairness, fundamental fairness.” According to a recent study by the Legal Aid Society and the New York Bar Association, having legal representation would reduce tenants’ chances of eviction by over 75%. The inaccessibility of legal services makes it much easier for landlords to force out longtime tenants and replace them with newcomers willing to pay higher rents. 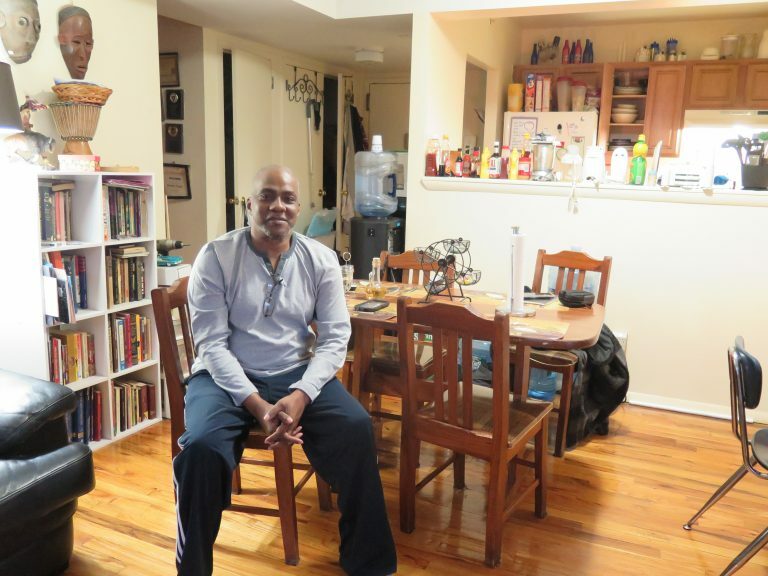 “Landlords are seeking an opportunity to get rid of the people who are there, and charge higher rent,” says Ezi Ukegbu, an attorney at Brooklyn Legal Services Corporation A, who has represented hundreds of low-income tenants in gentrifying neighborhoods in Brooklyn. In 2013, de Blasio established a pilot program that increased funding for housing legal services from $6 million to $62 million annually, providing representation for residents of 10 ZIP codes with a high eviction rate. According to the New York City Office of Civil Justice, eviction rates in the city dropped 18 percent within a year, and now are at their lowest levels in a decade. When Randy Dillard, a disabled single father of five in the Norwood neighborhood in the Bronx, received an eviction order for nonpayment of rent in 2012, he feared that he and his children were headed into the city’s homeless-shelter system. But the order was unwarranted: Dillard receives federal Section 8 rent subsidies, and the program had stopped paying the subsidies to his landlord, a city police detective, after inspectors found the building had serious housing-code violations. “The windows were not insulated. We had to put water on the stove to heat our home. He was a slumlord,” says Dillard, a former union bricklayer who has been unemployed since he was diagnosed with a chronic lung condition 15 years ago. Thanks to the advice of a friend, he found a pro bono lawyer at Part Of The Solution, a Bronx nonprofit. The lawyer “informed me that my landlord had no right to take me to court,” Dillard says. “Section 8 owed [my landlord] the money.” The attorney eventually paved the way for Dillard to move into a new building. Dillard’s apartment, like Carmen Vega-Rivera’s, was rent-stabilized. Landlords increase their profits by evicting tenants in rent-stabilized apartments and raising rents, especially in gentrifying neighborhoods. “If there’s a demand in the neighborhood, it’s always in the landlord’s interest to have a vacancy,” said Bill Bryan, an attorney at the Brooklyn Public Defenders Office. Landlords can legally increase rents by 20 percent on a vacant apartment, more if they renovate it, and they usually can get away with illegally charging even more. Under state law, tenants are not allowed to challenge rent increases more than four years old unless there is clear evidence of fraud. “There are lots of recent graduates who would be happy to pay $1,400 a month for a one-bedroom… and wouldn’t think to go and see the rent history for the apartment and try and find out if the rent they are being charged is legal,” says Raun Rasmussen. Vacant apartments where the rent has reached $2,700 are deregulated. The city has lost almost 175,000 rent-stabilized apartments in the past 13 years. Landlord groups submitted written testimony against the right-to-counsel bill at a Council hearing in September noting its costs to taxpayers and argued that there are few benefits to drawing out eviction proceedings for tenants who cannot pay their rent. “Counsel serves merely to prolong the inevitable through frivolous delaying tactics so that their client can remain with a roof over their head for as long as possible when there is no justification for their continued tenancy,” said Mitchell Posilkin, general counsel for the Rent Stabilization Association. Yet, the bill received fervent support from politicians and activists across the city. It was cosponsored by 42 of the 51 City Councilmembers, and a New York Times editorial endorsed it. If it is enacted, New York City’s Right to Counsel will be a triumph for the city’s most vulnerable communities, and could serve as a model for other U.S. cities ensnared in cycles of eviction, displacement, and gentrification.